Antigua and Barbuda is an island nation located in the eastern Caribbean Sea on the boundary with the Atlantic Ocean. Antigua ( IPA: [ænˈtiːgə]) and Barbuda ( IPA: [bɑrˈbjuːdə]) are located in the middle of the Leeward Islands in the Eastern Caribbean, roughly 17 degrees north of the equator. Antigua and Barbuda are part of the Lesser Antilles archipelago with the islands of Guadeloupe, Dominica, Martinique, St. Lucia, St. Vincent & the Grenadines, Barbados, Grenada, Trinidad and Tobago to the south, Montserrat to the southwest, Saint Kitts and Nevis to the west and Saint Barthélemy, Saint Martin and Anguilla to the northwest. Pre-ceramic Amerindians were the first to inhabit the islands of Antigua and Barbuda in 2400 BC. Later Arawak and Carib Amerindian tribes populated the islands. The island of Antigua was originally named Wadadli by the natives. Christopher Columbus landed on his second voyage in 1493 and gave the island the name Antigua. Early settlements by the Spanish and French were succeeded by the English who formed a colony in 1667 by transporting Irish Catholic slaves to Antigua. Slavery, established to run the sugar plantations on Antigua, was abolished in 1834. The islands became an independent state within the Commonwealth of Nations on 1 November 1981, and Vere Bird became the first prime minister. Politics of Antigua and Barbuda takes place in a framework of a federal parliamentary representative democratic monarchy, whereby the Prime Minister is the head of government, and of a pluriform multi-party system. Executive power is exercised by the government. Legislative power is vested in both the government and the two chambers of the Parliament. The Bicameral Parliament consists of the Senate (17-member body appointed by the governor general) and the House of Representatives (17 seats; members are elected by proportional representation to serve five-year terms). The last elections held were on 23 March 2004 for the House of Representatives (next to be held in 2009). The Antigua Labour Party got 4 seats, while the United Progressive Party got 13. Since 1949 the party system had been dominated by the personalist Antigua Labour Party. However the Antigua and Barbuda legislative election, 2004, saw the defeat of the longest-serving elected government in the Caribbean. The Prime Minister, Lester Bird, had been in office since 1994, when he succeeded his father, Vere Bird. The elder Bird had been Prime Minister from independence in 1981, and before independence had been Chief Minister of Antigua from 1960, except for the period 1971-76. The Head of State is the Queen, who is represented by the Governor-General. A Council of Ministers is appointed by the governor general on the advice of the prime minister. The Judicial Branch is the Eastern Caribbean Supreme Court (based in Saint Lucia; one judge of the Supreme Court is a resident of the islands and presides over the Court of Summary Jurisdiction). Antigua is also a member of the Caribbean Court of Justice. The Supreme Court of Appeal was the British Judicial Committee of the Privy Council, up until 2001, when the nations of the Caribbean Community voted to abolish the right of appeal to the Privy Council in favour of a Caribbean Court of Justice. Some debate between member countries had repeatedly delayed the court's date of inauguration. As of March, 2005, only Barbados was set to replace the process of appeals of Her Majesty in Council with the Caribbean Court of Justice which then had come into operation. 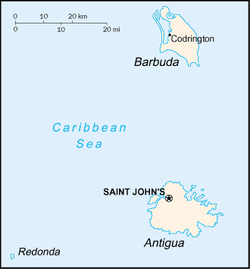 The island of Barbuda (1,241) and the uninhabited island of Redonda each enjoy dependency status. The country consists of a number of islands, of which Antigua is the largest one, and the most populated. Barbuda, just north of Antigua is the other main island. The islands have a warm, tropical climate, with fairly constant temperatures year round. Redonda – annexed in the 1860s when Phosphate reserves were noted, unoccupied since 1930 also belongs to the nation of Antigua and Barbuda. The islands are mostly low-lying, with the highest point being Boggy Peak, at 402 metres (1,319 ft). The small country's main town is the capital Saint John's on Antigua; Barbuda's largest town is Codrington. Most of the population are descendants of the slaves that used to work in the sugar plantations, but there are also groups of Europeans, notably Irish, British and Portuguese. While the official language is English, most of the locals speak patois, a form of Creole English. Almost all Antiguans are Christians, with the Anglican Church (about 44%) being the largest denomination. Catholicism is another significant denomination. Non-Christian religions practiced on the islands include Rastafarianism, Islam, and Baha'i. The following information is derrived from the Antiguan website "Antigua Nice"
The Museum of Antigua & Barbuda was opened in 1985 and is operated by the Historical & Archaeological Society, a private non-profit organisation. The exhibits, which interpret the story of Antigua from its geological birth to political independence, are placed in the old St. John's Court House of 1750, a very historic building. Today, it is indeed a fine setting for an interpretive museum and is an excellent example of adaptive use for the oldest building of the capital city. Collecting is central to the mission of the Museum. It acquires objects and specimens by field collecting, gifts, loans, and exchanges and welcomes input from all those who are interested in preserving and expressing the island's heritage. Other objectives are education and research of the nation's heritage. It presents to visitors an overview of the island's history and natural history. There is a fine reference library and there are many computer databases totalling 25,000 records, available for quick reference. Some of the Museum's programmes include an education programme for Antigua & Barbuda's schoolchildren, providing special lectures and the organising of monthly field trips to historic sites. Cultural evenings are held for the general public, and a newsletter is distributed to the Society's members. The Museum has something for everyone. Come in and enjoy the historic atmosphere in a cool oasis in the middle of St. John's, purchase gifts, meditate and forget the cares of the world. The Dockyard Museum interprets the story of Antigua's famous English Harbour. The harbour was known to be first used in 1671 as a hurricane shelter and for the act of careening warships of the Royal Navy. It was not until 1725 the first buildings were erected for maintaining British ships on the West Indies Station. The museum tells the story of how the Dockyard was built, its purpose, the social conditions encountered by the people who worked and toiled in this ancient naval establishment. A fine figurehead welcomes visitors to the museum. Also on display are ship models, tools, instruments and excavated artifacts from the naval hospital and other dockyard buildings of the sailing ship days. There is an interesting case of Nelson memorabilia which contains the famous admiral's telescope and other items. The story is told to the present day, of the yards restoration from the 1930's and of the return of the sailing ships in the 1950's in the form of cruising and charter yachts. There is a library of reference books embracing many subjects. The library includes a lending section as well as a paperback swop section. A large database of naval history is available for researchers, as well as all the historical databases available at the Museum of Antigua & Barbuda in St. John's. A gift shop sells items connected to the sea and to the harbour, including maps, charts and posters. A visit to this famous dockyard is not complete without a visit to it's museum and giftshop. Today you can visit Nelson's Dockyard where many of the restored buildings house modern facilities that still reflect the naval heritage of English Harbour. Private yachts now replace Naval vessels in the harbour, But English Harbour remains a favorite port for those making the long Atlantic crossing. English Harbour and Nelson's Dockyard also has a number of tourist facilities, including banks, restaurants, t-shirt market and tour and travel agencies. At the north-eastern point of Antigua there is a remote wild area known as Indian Town Point. Why it was named thus, is unknown as to date no Indian archaeological remains have been found on this peninsula. The area was legally constituted a National Park in the 1950's. Within the park there is a remarkable example of sea-water erosion. Geological, Devil's Bridge is a natural arch carved by the sea from soft and hard limestone ledges of the Antigua formation, a geological division of the flat north-eastern part of Antigua. A bridge was created when a soft part of the limestone eroded away by action of Atlantic breakers over countless centuries. Sammy Smith, a 104 year old Antiguan patriot had the answer. Here is a quote from his memoirs "To shoot Hard Labour". Betty's Hope is located in the limestone district of Antigua's tranquil rural area, with beautiful vistas over the rolling landscape to the distant ocean. The founder of Betty's Hope was Governor Keynell, whose widow inherited the estates upon is death in 1663, but had to flee Antigua during the French occupation in 1666. When Antigua was reoccupied by the British, Parliament annulled all land claims prior to the French occupation, (of those who had fled or been disloyal to the Crown). Instead, in 1674, Betty's Hope was granted to the Codrington family, then residing in Barbados. Like other large plantations, Betty's Hope was an agricultural as well as an industrial enterprise, and home to a large number of people. Supervised by a handful of European managers, hundreds of Africans lived out their lives on this and similar plantations, first as slaves, then as laborers after emancipation in 1834. Enduring the hardship of cultivating and processing the sugar under exhausting conditions, they developed great skills as craftsmen, boilers and distillers which gave Betty's Hope its reputation for excellence lasting to this day. Today an active restoration of Betty's Hope is under way. New sails have been installed on the mill and the crushing machinery has been restored to working condition. The next phase of restoration involves repairing the cistern complex and the planting of trees and crops of former times. A visitor centre has been created by converting a former cotton house storeroom into a museum. This includes various aspects of the plantation's history and shows early estate plans, pictures and maps, artifacts and a model of the central site to giving an overview of the of "Betty's Hope". If you are on a Cruise ship Holiday in the Caribbean and visiting Antigua, this is your first stop on our little corner of paradise. The Antigua cruise ship dock is located at Heritage and Redcliffe Quay, in the capital of St, John's. This modern 900 foot dock, built in 1988, accommodates up to 4 cruise ships a day touring the Caribbean. The Cruise ship dock is just steps away from many duty free shops, restaurants, boutiques, and services at Heritage and Redcliffe Quays. From here shop, have lunch, or take one of the popular taxi tours around the island or to one of our fantastic Antigua beaches. For more ideas on things to do take a look at our Great Days Out category. We hope you enjoy your visit to Antigua on your Caribbean Cruise Ship holiday. If you want to talk to others who have stopped off on a cruise for the day in Antigua visit the Cruise Critic Forum and find out what they did and what they thought about it. If you like a town with atmosphere and entertainment then cruise ship days are a great day to visit St. John’s. If you prefer quieter shopping then days when less or no boats are in will suit you better – the choice is yours. In 1951, when the Antigua Trades & Labour Union was in its infancy, Union field officers went into the estates and said no crop would start until the workers were told their rates of pay. Sugar cane cutters had already been on strike for three months and both the workers and the Antigua Sugar Estates were losing money. Subsequently the employer, Mr. Alexander Moody-Stuart, had stated he would starve the workers into submission. Meetings were arranged between the workers and Moody-Stuart, and one of these was under the old Tamarind Tree and the other was at Betty's Hope estate. The employer, sitting on his white horse, insisted on speaking first, "I know you are losing a lot of money, you are losing wages and may I admit that I am losing much myself. I think you should stop this thing and you should go back to work". The answer from the workers was unanimous. "You said you were going to starve us into submission. Nobody shall ever use that remark again. We are not going to work for the balance of the year". For the rest of that year no crop was reaped. The people went into the fields, picked natural resources such as Widdy-Widdy bush Corchorus siliquosus and went down to the sea to collect cockles and wilks Livona pica. Without pay they managed to survive, though it was hard. On Jan 2 1952, after a long strike, the workers got the 25% increase they had asked for. The strength, determination, solidarity and sacrifice of the workers fighting against tyranny and injustice had brought the sugar barons to their knees...and much of it had happened in the meeting place of this old tree. The workers had won their rights by their own enormous efforts. It was one of the greatest accomplishments of Antigua people. This historical landmark may be found about one and a half miles from Bethesda on the road towards the northeast. It grows on the north side of the road on a slight curve. Underneath the tree a large boulder has been placed to mark the spot for future generations. This expanse of freshwater is reputed to be largest in the Eastern Caribbean. It is about a mile long and half a mile wide, when full. It covers an area of about 320 acres and holds 1 billion gallons of water. This water is held by two dams; the largest is the Potworks dam at the eastern end and the Delaps dam is to the south. The reservoir is named after an 18th century pottery works at the Garden estate, which was owned by the Codrington family from the early 18th to the end of the 20th century. A part of the dam is built over the site of the works and a 19th century bridge. Skilled black potters using a wheel and kiln technology made sugar pots here. The main product was a conical sugar pot used for draining molasses from raw sugar. The Potworks dam was planned in the late 1960's. While work was underway in 1968, only 24 inches of rain fell during the entire year; Antigua's average rainfall is 44 inches a year. Scarcely had the dam been finished when great rains filled the reservoir to capacity. Potworks dam and its reservoir were officially opened on 28th May 1970, and there is a small monument on the west of the dam commemorating this event. Potworks served well in 1974, when there was little or no rainfall from January to mid-August. In September 1984, 5.58 inches fell to end a drought. Potworks dam caught 20 million gallons of water. There is interesting bird watching around the western edge of the reservoir. Some of the year round species include the West Indian whistling duck Dendrocygna arborea, snowy egret Egretta thula, cattle egret Bubulcus ibis and the osprey Pandion haliaetus. The church was designed by Mr. Robert Cullen and had a short steeple at its western end. After over a century, the church was elevated to the status of a cathedral when the Diocese of Antigua was created in August 1842. As plans were being made to make the church worthy of its new status, a violent earthquake severely damaged it in February 1843. Temporary repairs were made and in it Bishop Daniel Davis was enthroned as the first Bishop of Antigua. Next to the site of the first two churches a new purpose built cathedral was planned and approved by the House of Assembly. The Governor, Sir Charles Augustus Fitzroy, laid the cornerstone on October 9, 1843 and on October 10 three years later, the Cathedral was opened for divine service. It was consecrated on July 25, 1848. The Cathedral is built of freestone and the architect was Mr. J. Fuller of Bath and the Clerk of Works was Mr. F.W. Rowe of Bristol. The interior is encased in pitch pine, intending to secure the building from ruin during earthquake or hurricane. It has been described as "a building within a building". The Cathedral is dominated by twin towers at the west end and provides a distinct baroque flavour. They are 70 ft high and the cupolas that crown the towers are aluminium in colour. At the time of erection, the edifice was criticised by ecclesiastical architects as being like "a pagan temple with two dumpy pepper pot towers", however in modern times the edifice has been cited as "the most imposing of all the Cathedrals of the West Indian Province". Originally the south gate was the main entrance to the Cathedral. On top of its pillars are the bronze figures of St. John the Divine and St. John the Baptist. H.M.S. Temple is said to have taken these figures from a French ship destined for Martinique in 1756 during the Seven Years War. The iron gates themselves date from 1789. A centenarian, Samuel Smith in his memoirs (To Shoot Hard Labour), says the planters called the Cathedral 'Big Church' and that it frightened the people as a symbol of English power. He also said that the Anglican Church catered more for the planter class, but the black people got more involved at about the time of World War I. At last some black persons names were memorialised on the cathedral's walls. After walking about half a mile along dry scrubland with scattered trees, the spillway of the dam appears. The workmanship of this fine example of Victorian industrial architecture is truly magnificent with its rounded capping and small round tower. The reservoir was started in 1890, but there were complaints in 1897 that it could not hold water. However, it was finally finished to perfection in 1900. It was designed to hold 13 million gallons. Nine years later it had to be repaired again. It was then supplying thirty water tanks in fifteen villages. In 1912, after three years of drought, Wallings became empty, but later heavy rains fell in October and November of that year. A small additional dam creating the Fig Tree reservoir next to the main road was finished in November 1945. This was used to pump additional water up to Wallings. Together these two reservoirs cover 268 acres with a storage volume of 50 acres/ft. In 1915, 13 acres of the reservoir catchment area were sown with tree seeds with a view to reforestation, as the area had become denuded after the turn of the century. In recent years some attention has been focused for both watershed protection and forestry products. Follow the east bank and find a rough footpath that meanders upwards into the forest. Proceed slowly and quietly to listen and watch for birds. If you are lucky you could observe a black whiskered vireo (Vireo altiloquus), Antillean euphonia (Euphonia musica) or a red-necked pigeon (Columba squamosa). On your way back, explore the back of the reservoir where some interesting water diversion channels and sediment traps can be seen. The predominant tree species are locust Hymenaea courbaril, ironwood Exostema caribaeum, mahoe Daphnosis caribaea, black loblolly Pisonia fragrans, and mango, Mangifera indica. Of the mid-level types are white cedar Tabebuia pallida, turpentine Bursera simaruba, and gunstock Gauzuma martinicense. In the lower level are mahogany Swietenia mohogani, Spanish oak Inga laurina and white prickle Zanthoxylum martinicense. In a certain area near the reservoir, picnic tables have been installed. Plan to make an outing into this section of Antigua's forest - a perfect place for peace and quiet in this bustling world - full of history and natural history. Cricket is very popular in Antigua and Barbuda, along with most Commonwealth nations. The 2007 Cricket World Cup will be hosted in the West Indies from 11 March to 28 April 2007. Antigua hopes to host some matches at the Sir Vivian Richards Stadium, which is still under construction, and will hold 20,000 people at full capacity. Football (Soccer) is also a very popular sport and in its season, it seems to be the topic on everyones' mind. Antigua has a national football team but because of lack of experience not much has come out in that sector. Athletics is also big in Antigua. In the schools from a young age talented athletes are trained and Antigua has produced one or two fairly adept athletes. Janelle Williams, a young athlete with much promise hails from Grey's Farm, Antigua. Also, there is Sonia Williams and Heather Samuel who have represented Antigua at the Olympic Games. The national dish is fungie (pronounced foon-gee) and pepper pot. Fungie is a dish very similar to the Italian Polenta being made mainly of cornmeal. Other local dishes include ducana, season rice, Saltfish and lobster (from Barbuda). There are also local confectionaries which include: sugarcake, fudge, raspberry and tamarind stew and peanut brittle. Although these foods are indigenous to Antigua and Barbuda and to some other Caribbean countries, the local diet has diversified and now include the local dishes of Jamaica (e.g. jerk pork), Guyana (e.g. Roti) and other Caribbean countries. Chinese restaurants have also begun to become more mainstream. The supermarkets sell a wide variety of food, from American to Italian. Meals also vary depending on social class. A typical breakfast in Antigua might include cereal or a sandwich and tea/chocolate milk. Dinner is definitely the most varied, as it differs depending on taste, social class and education on nutrition. But it will typically include a starch, like rice/macaroni/pasta, vegetables/salad, an entree (fish, chicken, pork, beef etc.) and a side dish like macaroni pie, scalloped potatoes or plantains. Local drinks are mauby, seamoss, tamarind juice, raspberry juice, mango juice, lemonade, coconut milk etc. Adults favour beers and rums, many of which are made locally. Sunday is the main Sabbath of the country and is the day when the culture is mostly reflected in the food. For breakfast one might have saltfish, eggplant, eggs, bacon, sausages, or lettuce. Dinner on Sundays is eaten earlier (around 2:00 pm) because parents are usually off from work and can stay home and cook. It may include pork, baked chicken, stewed lamb, or turkey, alongside rice (prepared in a variety of ways), macaroni pie, salads, and a local drink. Dessert may be ice cream and cake or an apple pie (mango and pineapple pie in their season) or Jello. Antiguan Creole is a dialect spoken on the small Caribbean island of Antigua and Barbuda although the Barbudan accent is slightly different. Persons of higher social status find it easier to switch between Standard English and Antiguan English (dialect) mainly because of better education. The Dialect gets more raw the lower down the socio-economic ladder one moves. In the years before Antigua and Barbuda's independence (in 1981), Standard English was widely spoken, but after independence, perhaps as a avenue of defiance Antiguan's taught themselves that speaking dialect was a part of their culture and that nothing at all was wrong with it. Many of the words used in the Antiguan dialect are derived from English and also African origins. The dialect was formed when slaves owned by English planters imitated the English of their masters but failed to pronounce it correctly. This can be easily seen in some phrases like: "Me nah go" meaning "I am not going." Another example is: "Ent it?" meaning "Ain't it?" which is in itself dialect and means "isn't it?" Common island proverbs often can be traced to Africa. William Harper - US Senator (South Carolina) in the 1800s. Antigua was an important port to Great Britain in the sailing ship days. Because of its unique position in relation to the trade winds, it was hard for ships to leave the port and easy for ones to come in. Therefore, when enemy ships tried to retreat back out to sea, it was very difficult for them, and they could more easily be caught by the British Navy. The Antigua Racer Snake is the rarest snake in the world, with only about two hundred living. It is found on Bird Island, a island off the coast of Antigua. Dickenson Bay Beach, and Half-moon Bay, two beaches in Antigua have been named by wikipedia.co.uk as Two of the Best Beaches in the World. Antigua and Barbuda claim to collectively have 365 beaches, one for every day in the year. This has never been tested and is taken lightly as humour. Vere Cornwall Bird Antigua and barbuda's first Prime Minister is accredited to have brought Antigua and the Caribbean into a New era of independence. Antigua and Barbuda has been named the best Island Wedding Destination in the 12th annual International Caribbean World Awards. And has been cited by the Guinness world records as having the most marraiges per capita. Antigua's English Harbour Rum has been named one of The Best Rums in the World by Forbes Magazine. Claudette Peters, Antigua's Soca princess has been awarded Best new Female Aritist in the international Soca Awards. Young Destroyer, An Antiguan Calypsonian is now crown the Calypso King of the World after winning the CARIFESTA Calypso Competition in September 2006 in Trinidad. Eric Clapton, Musician, has founded a Rehabilitation Clinic, the The Crossroads Centre, in Antigua which has had celebrity visitors like Whitney Houston. Giorgio Armani, fashion designer, has a million dollar mansion in Antigua. Antigua and Barbuda is a member of the Caribbean Community, United Nations, World Trade Organization, Commonwealth of Nations, Organization of American States, Organisation of Eastern Caribbean States, and the Eastern Caribbean's Regional Security System. Antigua and Barbuda is also a member of the International Criminal Court with a Bilateral Immunity Agreement of protection for the US-military (as covered under Article 98).